The Premier League is launching its first-ever ad campaign, with a TV spot starring players including Theo Walcott and Gary Cahill interacting with kids at a primary school as they read from TH Palmer's inspirational poem Try, Try, Again. The campaign by Y&R London, which is specifically for school community programme Premier League Primary Stars, breaks on Sunday 2 April and will span TV, press, cinema, social media and other digital channels. In the past, the Premier League had relied on its title sponsor to advertise, but in June 2015, it announced that it was dropping the main sponsor from its title, making Barclays the last-ever sponsor. The 60-second TV ad will air between 7pm-8pm on Sunday 2 April during the final of The Voice on ITV. Its cast includes players including Manchester City’s Kevin De Bruyne, Chelsea’s Cahill, Spurs’ Eric Dier, Liverpool’s Sadio Mané, Manchester United’s Juan Mata and Arsenal’s Walcott. The ad opens with Manchester United manager Jose Mourinho in a playground ringing the school bell. Various players make appearances in classrooms and on the playing fields quoting Palmer, while vignettes show individual children reading phrases from the poem. It ends with a voiceover, which says: "We’re helping to inspire primary school kids in everything from maths and English to teamwork and sport. Search Premier League Primary Stars to get your school involved." 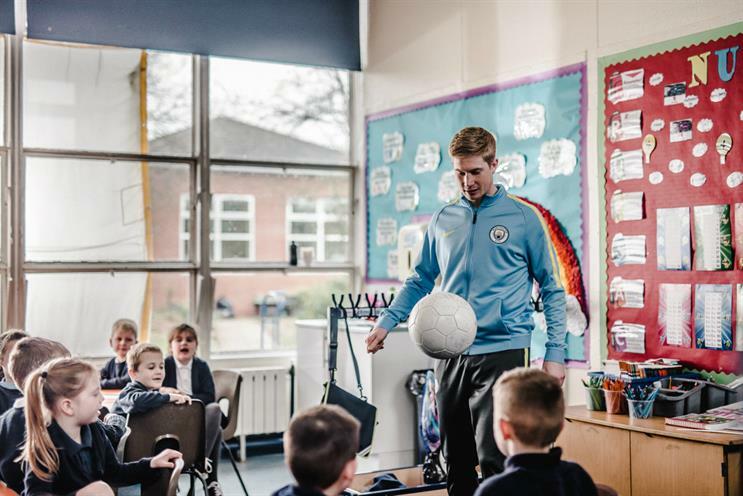 Other campaign activity will include a 30-second cut of the TV ad and an online content series that tells the stores of Premier League Primary Stars lessons and the impact they have using VOD, digital and social media. Richard Masters, the Premier League’s managing director, said: "The campaign highlights the vast amount of work being delivered by professional football clubs in their local communities. Our goal is to connect the Premier League to the heart of the community, namely families and schools, to promote learning and fitness to children and tangibly demonstrate the benefits of football in all aspects of life." The work was created by Nicola Wood and Andy Forrest. Media was planned and bought by MEC. The TV ad was produced by Gorgeous and directed by Vince Squibb. Premier League Primary Stars is a curriculum-linked teaching resource for primary school pupils and their parents. It aims to support 10,000 primary schools by 2019, targeting mothers, teachers and young fans.